Federal Eagle was one of two patterns that made up the Hearth Group, the other pattern being Brittany Blue. Federal Eagle was released on only three items. “Pyrex Ware proudly presents Hearth Group,” stated a 1967 advertisement from Corning Glass Works. Federal Eagle and Brittany Blue were the two patterns released in this new line of products. The Hearth Group line debuted new Pyrex shapes and sizes with the Brittany Blue pattern. Though available as part of the new Hearth Group line, Federal Eagle was released on a limited number of items. Sold individually was the 1 ½ quart Mixing Bowl (478) and the 3-quart Mixing Bowl (479). Also available was the 9 oz. mug (489), which exists in two versions. 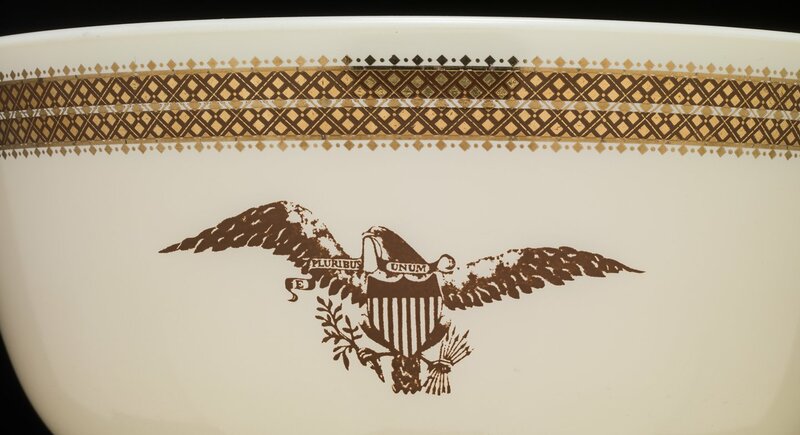 One version resembles the mixing bowls with a large brown eagle printed on a creamy yellow background with a gold band circumnavigating the bottom of the mug. The other version is solid brown with a gold band along the bottom of the mug. The Federal Eagle Mixing Bowls retailed for $2.95 and $3.95 while the mug with the large eagle retailed for $1.95 and the solid brown mug retailed for $1.75. Production on both Federal Eagle and Brittany Blue ceased when the Hearth Group line was discontinued in 1968.